TWEEDMILL Picnic Rug In Pink And Blue.Excellent Condition. 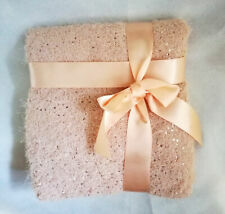 Wrap up warm with this gorgeous blush pink plush throw. Super Soft Plush Fleece Throw. Soft to touch, this throw is also great for placing on sofas or armchairs as a decorative piece. Bring a style update to your bedroom with this soft and snuggly throw. Soft and cosy, this lovely Unicorn throw is the perfect snuggle partner. Gorgeous Pink Unicorn Glow In The Dark. Wrap up warm with this glow in the dark Unicorn pink throw. Soft Fleece Throw Blanket. Ian Snow Pink & Yellow Pom Pom Cotton Throw. Ian Snow Pink & Yellow Cotton Throw with Pom Poms. This is a beautiful, loosely woven soft throw in a natural and coloured zigzag stripe. Material: Cotton. From the new Primark Aristocats Range. Lovely hanging storage unit. The size of the unit is 28 cm x 58 cm. The unit comprises of two compartments featuring the little cat, Marie, herself. A lovely gift for anyone. This item is new in tagged. Pretty little hand crochet cot/dog/knee blanket colour dark green. has never been used, made about 5 years ago. Cath Kidston Crochet Throw This gorgeous throw will look stunning over the end of a bed, adding a romantic, vintage feel. Made from 100% cotton, beautifully crafted in a pretty design with scalloped edging. The item has been cleaned has a nice fresh smell but the colour may have faded just a little, if you ask me that only adds to the charm, it's otherwise in lovely condition. If my linen cupboard wasn't bursting at the seams I'd be keeping this for myself! Measures approx 65" x 90" (please remember that as this crochet it will stretch) If you are the winner of this item please make payment via PayPal within 3 days of auction end. Thanks for looking! Tweedmill Textiles - Beehive Throw in Stunning Cerise Pink and Cream. This beautiful colour way is a popular addition to the "Beehive range" by Tweedmill Textiles. Super soft pure new wool blanket / Throw. Our gorgeous Kildare Blanket is perfect for draping over a bed, sofa or armchair. A soft blush pink back drop with subtle ivory checks & fringe creates a modern spring style. Reminiscent of traditional Irish woollen throws this beautiful throw is generously sized at 130cm x 170cm. Beautiful British Made Tweedmill 100% Pure Wool blanket. This item is A traditional check/tartan throw/ blanket /travel, picnic rug in Raspberry pink, green and Grey. As seen in Photo 1. High quality, luxury Item. BACKED IN SOFT FLANNEL IN PALE PINK. BEAUTIFUL HANDMADE THROW / BABY BLANKET. 120cm x 150 cm. Unicorn Fleece. Soft Coral Pink Background with Unicorns and. Supersoft Microplush Fleece Throw. Fully washable at up to 40 degrees. Lots of uses, bedroom, sofa, car, caravan. 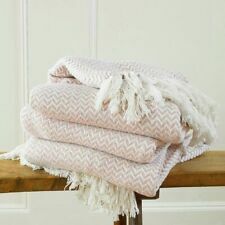 Gorgeous new soft blush pink with a geometric print throw blanket. Colour: Blush Pink. Material: 100% Polyester. Approx size: 150 x 120cm. Machine washable. This lovely super soft throw, in a soft blush pink, featuring a gold toned, geometric pattern. Will keep you lovely and warm in those cold winter nights. Or you can throw over an arm of a chair or sofa. Will add a contemporary feel to your living space. Brand new. Thanks for looking. Thank you for your purchase. Please take a look in my shop for more home treats. **Please contact me if you have any issues with your purchase, I will do my very best to resolve any problems.